Bringing new life into this world is a miracle – a miracle which bears repeating (no pun intended). In all seriousness though, the Christmas Season revolves around the miracle of new life and the gifts it brings (wo)man kind. Mothers carry an immense responsibility. I believe all Mothers should be considered Holy for their willingness and miraculous ability to grow, carry, and deliver New Life from Heaven to Earth. Christmas is maybe The Most Appropriate Time to give thanks to All Mothers. This Season, call, write and visit your Mother. Thank her for being willing to sacrifice herself, her body, and her Life for Motherhood. There is A Word which I believe completely describes Motherhood. The Word is grossly overused. I believe 2010 should be the Year of recapturing its true meaning. In 2010, Recapture the True Meaning of Awesome. Reserve It. Keep It Sacred. Use it for only the most Amazing and Transformative Events. Just like Mary giving birth to the Christ, when a woman becomes a Mother, something happens that is not of this Earth. Birth is a True Miracle. Thank you, to All the Beautiful & Holy Mothers of this Earth. No matter where your Beliefs are Rooted, remember this Season brings Universal Peace, Harmony, and Loving Kindness for All. 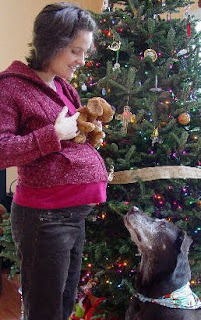 *the photo was taken of me just days before the Christmas birth of my first son, and of course, our family’s now 14.5 year young Labrador.